MS Dhoni, the Chennai Super Kings captain, has been fined 50% of his match fees for a code of conduct breach during his team's match against Rajasthan Royals in the 2019 Indian Premier League. 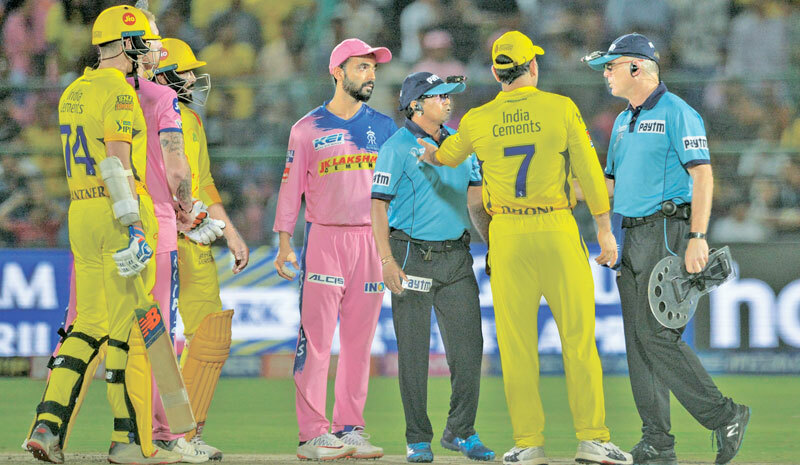 Dhoni, whose measured knock of 58 on Thursday, 11 April, was instrumental in Chennai's tense win at the Sawai Mansingh stadium in Jaipur, was penalised for storming onto the field in an uncharacteristic outburst over a no-ball decision in the final over of a close match. Chennai needed 18 to win at the start of the over and managed to reduce the equation to eight from four before Dhoni was bowled off a yorker on the third legitimate ball. Ben Stokes then bowled what appeared to be a waist-high full toss to Mitchell Santner, the new batsman. Umpire Ulhas Gandhe, who was at the bowler's end, signalled a no-ball for height, but his colleague at square-leg, Bruce Oxenford, overturned the decision. The drama led to confusion among the Chennai batsmen. Dhoni, who appeared agitated at the sidelines, joined the confrontation on the field and was seen animatedly gesticulating to the umpires. He subsequently admitted to a Level 2 offence of the IPL’s Code of Conduct and accepted the sanction. The 50% fine levied on Dhoni is the minimum sanction for a first-time Level 2 offence. Article 2.20 of the IPL's Code of Conduct, under which he was penalised, refers to actions that are contrary to the spirit of the game. Stephen Fleming, the Chennai coach, defended the usually calm 'Captain Cool' at the post-match press conference. "My understanding in discussing it with the captain was that there was a no-ball called, and then there was confusion," he said. "Our understanding was the umpire at the bowler's end had called the no-ball, then there was confusion around whether it was a no-ball or not. MS was after some clarity and it didn't seem to be coming, so he took the opportunity to go out and discuss it with the umpires." Eventually, Santner's Dhoni-like six off the last ball helped Chennai clinch their sixth win this season. It was also Dhoni's 100th IPL win as captain. "Firstly, a hundred wins is great," Fleming said. "Secondly, Dhoni as captain is very successful, Dhoni as a player is outstanding. They are both very closely related." Chennai play Kolkata Knight Riders next on 14 April.